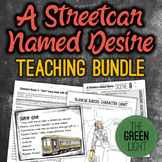 A Streetcar Named Desire lesson plans, Unit. 72 pp. of activities. 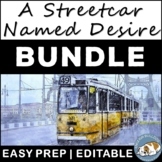 This download includes reading quizzes for all eleven scenes of A Streetcar Named Desire, along with an answer key. There are five questions per quiz. 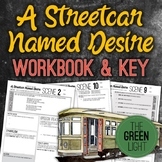 This is a complete unit with quizzes on scenes 1 - 4, 5-7, 8-11 plus answer key. The questions are based on higher order thinking, rather than recall. An essay prompt is also included. 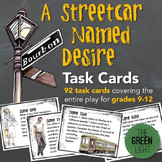 This product includes seven quizzes for the various scenes in A Streetcar Named Desire. True or False questions or character matching are included in these quizzes. 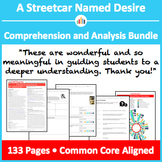 This product also includes a 45 question objective test. This test features character matching, order of events and true and false.